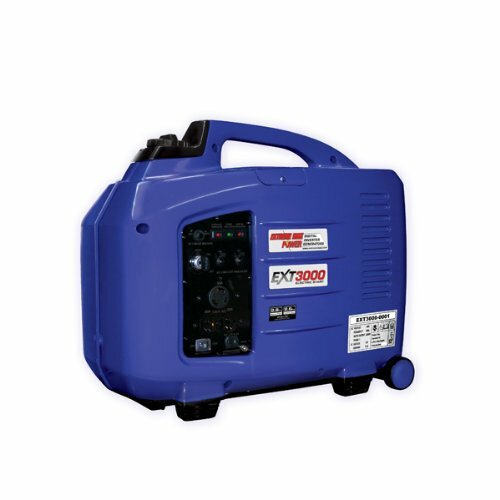 Extreme Max EXT3000 Electric Start Inverter Generator , selling for $799.99 brand new. Manufactured by Extreme Max. There are 2 units left brand new. 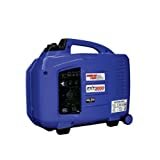 The Extreme Max Electric Start Generator is capable of handling the power demands of most RV’s along with air conditioning units with 2800 Watts maximum and 2600 continuous output. Features 20 Ampere and 30 Ampere receptacles. The electric key turn start makes it easy for any person to operate (back up pull cord included). This generator provides the best fuel economy with two power modes- economy for your lighter loads and full power for heavier loads. This generator is EPA 2012 compliant which means you can use it anywhere within the US. Engine specifications are engine type-4 stroke OHV, 1 cylinder. Displacement is 150CC, compression ratio is 9.2, engine speed is 5000RPM (ECO switch off), cooling system is forced air cooling, ignition system is capacitor discharge, oil capacity is 87 quarts, fuel tank capacity is 1.9 gallons, spark plug is A6RTC, noise rating is 58 decibels at 12 feet, dimensions are 21 inches length x 22 inches height x 12 inches weight. It includes a 12 volt charger and tool kit. It has a year parts and labor warranty. Previous post: 1800 Watt Solar Generator Complete with (2) 100 AH Batteries – For Homes, Cabins and More!